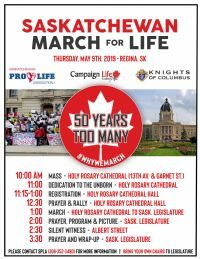 State Knights of Columbus provide a subsidy for buses and 15 passenger vans that are utilized to transport Brother Knights, their wives, family and other individuals intent on attending the 2019 March for Life in Regina. If wishing to travel in this manner, please contact the Culture of Life Couple to ensure the subsidy is applied. Contact information is either by e-mail at g.wiegers@sasktel.net or by telephone at 306-342-0033.